If you’re a book lover, you’ve probably stumbled across Goodreads, the ultimate social site for bibliophiles. If so, you probably already know how to use Goodreads as a reader. 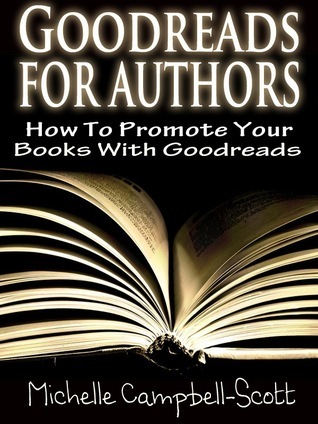 Goodreads for Authors by Michelle Campbell-Scott can show you have to use Goodreads as an author. I’ve been a longtime user of Goodreads, always perusing the site for new books to check out and connecting with other readers. As I began to embark on my writing journey, I realized that I could utilize Goodreads differently once I published some of my work. I came across Michelle Campbell-Scott’s guide during my search for more information on effectively using Goodreads. For those of you who have never used Goodreads, the first section of the book provides details on the basics of the site, such as how to sign-up and explore groups related to your interests. The rest of the book provides step-by-step instructions on how to use Goodreads to promote your work. You may have known that you can add your book to Goodread’s virtual library, but did you know that you could also use Goodreads to promote your blog by adding it to your profile or find reviewers for your next book? In addition to these detailed instructions, this guide also provides examples of what constitutes as bad etiquette, preventing you from encountering potential pitfalls. Goodreads for Authors is a helpful guide for navigating Goodreads and improving your presence on the site. Michelle Campbell-Scott’s guide is available on Amazon in Kindle, paperback, and audio format, as well as for rental with a Kindle Unlimited subscription. Authors: How have you used Goodreads to promote your work or grow your network? If you’re on Goodreads, connect with me here!